If you’re looking for a WordPress eBook plugin, you’ve come to the right place. This is the complete guide to listing and selling digital eBooks in WordPress. I’ll show you how to choose the right WordPress eBook plugin for your site – whether you want an eBook library plugin with downloadable PDF’s, or an eBook store plugin with full e-commerce functionality. In this article, I’ll teach you about 2 methods for creating a WordPress digital eBook library. They both one of our table-based WordPress eBook plugins – either Posts Table Pro or WooCommerce Product Table. They’re ideal for creating a WordPress eBook library or eBook store because the eBooks are listed in a searchable, sortable table layout with filters. I’ll show you how to use them alongside some high quality free WordPress plugins to add all the features you need. This is a non-ecommerce option, as people can download the eBooks directly from the list, without having to buy them individually. It’s suitable for free lists of eBooks, or eBook membership sites where you sell subscriptions giving access to your downloadable WordPress eBook library. This is a full e-commerce option, where people can view your eBooks in a table and purchase each one individually. They will then receive a protected eBook download link. You can choose between two popular WordPress eBook store plugins: WooCommerce and Easy Digital Downloads. Whether you use Method 1 or 2, use this section to add the finishing touches that will make your eBook digital library a success. I’ll show you how to create filters to make your eBooks easier to find, plus extras such as adding embedded audio players to a WordPress audiobook library. You’ll even learn how to create a private members-only ebook library that is hidden from public view. See a WordPress eBook library in action on our plugin demo page. Our WordPress eBook plugins are ideal because you can list lots of digital books on each page. Users don’t have to waste time scrolling through multiple pages. You can even include extra data about each eBook such as the author, blurb, image, publisher, year – whatever you like! Your users can quickly search, sort and filter the list to find an eBook they’re interested in. They can then either click to download a WordPress eBook PDF or other format such as EPUB or MOBI. Or if you’re using an e-commerce plugin, then they can add eBooks to the cart directly from the table of eBooks. I’ll recommend a suitable WordPress eBook plugin in the relevant sections of this tutorial. Read about the method you’re interested in, and I’ll tell you how to set it up and which WordPress eBook store plugins to use. Method 1 is about creating a digital library of eBooks. It uses our Posts Table Pro plugin to create a searchable, filterable table listing your eBooks. This method is ideal if you want to create a WordPress eBook library with downloadable eBook links. Users can find a digital book and click to download it as an eBook PDF or whatever format you decide to use. It’s suitable for free digital eBook libraries, and WordPress membership sites where people are given access to a protected eBook library. Method 1 is NOT suitable if you want to sell each eBook individually – you’ll need a WordPress eBook store plugin as well as an e-commerce plugin for that. If this is what you need then jump to Method 2 instead. Before you can create a table of eBooks, you need to store them on your WordPress website. The best way to do this is to create a custom post type for storing your eBooks. This creates a dedicated ‘eBooks’ area in the WordPress admin, and keeps them separate from your other website content. You’ll be glad you did this when your digital eBook library grows over time! Install and activate Custom Post Type UI. Hover over ‘CPT UI‘ on the left of the WordPress admin, and click the ‘Add/Edit Post Types’ link. Add a ‘Post Type Slug‘. This should be 1 word lowercase, e.g. ebooks. Add a ‘Plural Label‘, e.g. eBooks. Add a ‘Singular Label‘, e.g. eBook. Scroll down to the ‘Settings > Supports‘ section and tick or untick any WordPress fields that you wish to use for the eBook post type. I recommend keeping the fields that are already ticked, and also ticking ‘Excerpt’. This adds a useful extra field which you can display in the digital library using the WordPress eBook plugin. Scroll a bit further to the ‘Built-in Taxonomies‘ section. Tick the options that you want to use to sort and filter the contents of your eBook library. For example, if you intend to organize your eBooks using tags and categories then you need to tick these boxes. Title – add the eBook title to the top of the page. Categories and tags – add any categories or tags that will let people sort and filter the eBook in the digital library. Featured Image – upload an image, if you’re planning to include these in the WordPress eBook library. This will probably be an image of the eBook front cover or author. Click the ‘Add Media’ button and upload the downloadable book (e.g. in eBook PDF, EPUB or MOBI format). This will add a clickable link to the eBook into the content field. The link text will be the filename – you can reword it to anything you like. If you’d rather add a clickable icon or button instead of a plain text link, then you need to add the code for a button or icon instead. Your theme might include a button shortcode that you can use, or you can create buttons using a plugin such as Shortcodes Ultimate. If you’d rather add a ‘download’ icon, then you can use the icons that come with your theme or the free Better Font Awesome plugin. Excerpt – Use this to add the eBook’s blurb or description. The WordPress eBook plugin can include this as a column in the table. If you need to include any additional fields in your eBook then you can do this by creating custom fields and taxonomies. As a general rule, use custom fields for storing unique data about each eBook such as ISBN number or barcode. Use taxonomies for filterable data such as topic, publisher, year or author. I recommend the free Advanced Custom Fields plugin for creating custom fields. You can use the Custom Post Type UI plugin for creating custom taxonomies. Once you’ve created the extra fields for your eBook post type, you can add the data for each eBook. You can list all these extra fields in the digital library using the WordPress eBook plugin (see next section). By now, you’ve created a custom post type for your eBooks and added them all to WordPress. Great! Now comes the fun part – it’s time to create your WordPress eBook library. We’ll do this using the Posts Table Pro WordPress table plugin. It’s designed to list all sorts of information in an interactive table, and is particularly popular as a WordPress eBook plugin. Create your eBook digital library or store today! Here’s a video about how to use Posts Table Pro to create a WordPress e-book library. You’\ll also find written instructions below. Create a new page (Pages > Add New). Call it ‘eBook Library’ or whatever you like. This will list your eBooks in a table with 4 columns: featured image, eBook title, excerpt (which I suggested you used for the blurb or description), and content (which I suggested you use for the WordPress eBook download link or button). I’ve disabled the ability for people to click through to a separate page for each eBook – if you want this, then you can remove links=”none” from the shortcode. That’s everything you need for a professional-looking WordPress eBook library. If you want to make any further changes to it, skip to the section on Perfecting your eBook Library. So far, I’ve shown you how to create a table of eBooks that is available for everyone to access. If you don’t want this, then there are a few WordPress plugins to protect your eBook library and restrict it from public view. Here are 3 suggestions of how you can achieve this. Our WordPress Password Protected Categories plugin lets you put all your eBooks in a category and password protect that category. This will protect your eBook digital library with 1 or more passwords. Note: If you want to use Password Protected Categories with your eBook library then you’ll need to add the table of eBooks directly to the category archive template for your eBooks post type, instead of adding the Posts Table Pro shortcode to a standard page. There are basic instructions for this in the plugin knowledge base, but you might want to create a custom template for the eBooks post type so that it won’t change your blog category layouts too. You can ask your developer to do this, or post a job on Codeable to find someone suitable. The free Groups WordPress plugin is an easy-to-use free WordPress membership plugin. It offers an easy way to create ‘hidden’ areas of your website that only logged in users with access to the appropriate ‘Group’ can access. Install the Groups plugin, create your eBook library as described above, and create a Group called ‘eBook Library’ or similar. Go to to the eBook library page with the product table and restrict it to members of the eBook Library Group. To give people access to the eBook library, you need to add them as users in WordPress (Users > Add New). Select the eBook Library Group from the dropdown on the Add/Edit User page. When they log into their account, they will be able to access the protected eBook library. Use the Groups plugin documentation to make further changes. For example, you can create a message that will appear when unauthorized users try to access the hidden eBook library. You can sell access to the eBook library using the WooCommerce plugin with the Groups for WooCommerce add-on – plus Subscriptions if you want to take regular payments. This builds on the ‘Groups’ method in the previous section by integrating the hidden eBook library with the world leading e-commerce plugin and the ability for people to subscribe online. If you want people to make a one-off payment to your eBook library then you can do this using Groups, WooCommerce and Groups for WooCommerce. Sell access to the eBook Library Group as a product in WooCommerce, so that people can buy it on your website. If you want people to make an ongoing subscription to the digital eBook library, then you’ll also need the Subscriptions plugin. You still need to sell access to the eBook Library Group using WooCommerce, but buying this product will sign people up to an ongoing subscription. Payment will be taken regularly (e.g. using PayPal or Stripe) so that the customer can continue accessing the eBook library. If they ever cancel the subscription then their access to the Group will be revoked. Method 1 showed you how to create a downloadable eBook library – either public, or restricted to specific people. In Method 2, I’ll tell you about WordPress eBook plugins for selling eBooks individually. With these plugins, people can view a table listing all your eBooks. They can then choose to buy specific eBooks from the list. This is a full e-commerce solution – customers can pay for their eBooks online and receive the downloadable eBooks via a secure link. Easy Digital Downloads – EDD is famous for selling digital products such as eBooks. Coupled with a table-based plugin for displaying your eBooks, it’s the perfect way to create an e-commerce eBook library. WooCommerce – Powering over 41% of all online shops, you can use WooCommerce to sell anything online – including eBooks. Like Easy Digital Downloads, the default WooCommerce store layouts aren’t really suitable for eBooks. However, you can use it with a table-based WordPress eBook store plugin to create the perfect layout, complete with Buy buttons. You can also use other e-commerce plugins such as WP eCommerce. I haven’t featured them all in this article, but they all work with Posts Table Pro for listing your eBooks. I’ll tell you how to create a WordPress eBook library using both of these e-commerce plugins. The method is slightly different for each, so we’ll start with Easy Digital Downloads and then move on to WooCommerce. Easy Digital Downloads works perfectly with our Posts Table Pro plugin – use them together to build a fantastic eBook store. Your eBooks will be listed in a table layout with buy buttons. People can read about the eBooks in the table, and add as many as they like to the cart. They can then click through to the Easy Digital Downloads checkout and pay online. Once the order is complete, Easy Digital Downloads will send them a secure link to download the eBook in whatever format you’ve uploaded (PDF, EPUB, MOBI etc.). First install the free Easy Digital Downloads plugin. Use the official documentation to set up payment methods, taxes and more. Add each eBook as a separate downloadable product via Downloads > Add New. Next, create a new page (Pages > Add New) which you’ll use as your main eBook store page. Finally, follow the steps in our other tutorial about how to create Easy Digital Downloads table layouts. This covers everything you need to know to create an amazing eBook store layout using Posts Table Pro. You can create a single table listing all your eBooks, or multiple tables listing eBooks from different categories. There are over 50 options, so go through the tutorial and create the perfect eBook store. Now we’ve reached the only section of this tutorial that doesn’t use Posts Table Pro as your WordPress eBook store plugin. That’s because we have a dedicated WooCommerce version of Posts Table Pro, so we’ll use that instead. It’s called WooCommerce Product Table and is our bestselling plugin. The way it works is that you’ll add each eBook as a separate WooCommerce product. You’ll then use the WooCommerce Product Table to list the eBooks in a searchable table with filters. As with the Easy Digital Downloads eBook store plugin, you can list all your eBooks in a single table or create separate tables for each category. Either way, it’s easy for customers to find your eBooks, pay online, and receive a secure download link via email. See it in action on our WooCommerce eBook plugin demo page. First install the free WooCommerce plugin. Use the WooCommerce setup wizard and documentation to set up your standard store pages, tax settings, payment gateways (e.g. PayPal and/or Stripe for credit and debit card payments), etc. Next, add each eBook as a product (Products > Add New). Choose the ‘Downloadable’ product type in the Product Data section of the page. This will open up some extra options for you to add the downloadable eBook file(s) in whichever format you choose. This might be PDF, MOBI, EPUB or similar. Finally, create a new page (Pages > Add New) which will be used for your eBook store. Use the WooCommerce Product Table knowledge base to list your eBooks in a table layout with all the information you want to display. It’s really flexible and you can even store extra data about your eBooks using product attributes, custom fields and taxonomies. If you want to offer different price options then you can use variable products for this. Each price option will appear as a variation dropdown list next the add to cart button. Whichever of the above WordPress eBook plugins you use, don’t forget to add the finishing touches. The most important extra that you need to add are filters. You can add filter dropdowns above the eBook library for various options including categories, tags and any custom taxonomy. If you’re using WooCommerce Product Table then you can also add attribute/variation filters above the table, and filter sidebar widgets. All of these will increase your eBook sales by making them easier for people. If you’re selling audio books or have a promotional video, then you can embed media players directly into the main eBook library page. For example, you might be creating a WordPress audio book library and want to include MP3 players for your audio books. To do this, add an embedded audio or video player directly into any of the text fields in your eBook library (such as the main content area or a custom field). Go to the plugin settings page and tick the ‘Shortcodes’ option. This tells the WordPress eBook library plugin to render the embedded media player properly, instead of just as plain text. Next, your visitors will be able to listen to audio tracks or watch video directly from the main eBook library page. Add buttons to show extra images, the blurb, and more in a quick view lightbox. 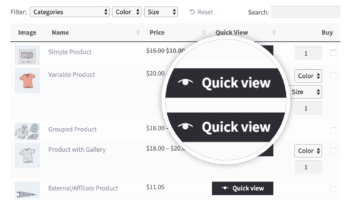 If you’re building a WooCommerce eBook store, then you can enhance your book lists with the WooCommerce Quick View Pro plugin. This handy plugin adds ‘quick view’ buttons (which you can rename to anything you like) to your eBook library pages. Customers click these buttons to view more information about your eBooks in a lightbox, without having to visit the single product page. Upload multiple images to the product gallery, and display these in the quick view lightbox. Use the images to preview different pages from your eBook, just like Amazon’s ‘Look inside’ feature. Add the blurb from the back of your eBook to the product short description, and display this in the quick view. Sell product variations (e.g. different eBook file formats or printed book options) in the quick view. These WordPress eBook plugins come with over 50 options for changing how the eBooks are listed in the library. View the full list of options for either Posts Table Pro or WooCommerce Table. Think about which ones will help you list your eBooks even more effectively. Spend some time experimenting to find the right combination of options, and make your WordPress eBook library a big success. Great instruction, thank you! I think it's more efficient to make a niche site for books. This site will be easier to promote. Thanks for sharing about these plugins and I got some new knowledge about the digital product downloads integration in WordPress. Thank you so much. Would it be safe to nofollow the ebook page once you create it ( for example outbound links)? I have been using sites like tradebit to sell and was thinking of inserting the embed code and not linking to the site. If depends if you want people to be able to find the ebook page directly from search engines. If you only want them to be able to find the page containing the table listing your ebooks then it's fine to noindex the individual ebook pages, or nofollow their outbound links. I am very interested in only renting access to ePub books that I publish for a very low monthly fee to church organists - many of whom are volunteers and cannot buy my printed book or downloads. Can using your software permit them to only read the books while their subscription remains active? Hi Noel, this would only work if the ebooks are published on a page on your website, as you can create an account for them, restrict it using a membership plugin or similar, and restrict their account after it expires. If the user downloads them to their device then there's no straightforward way to restrict access after their subscription expires. Thanks for a clear, straight-forward answer! I'm very interested, but we have more information about that, we need create online library for all books and paper related to engineering, we are member in Jordan Engineering Association and need create free online book for engineers and students as a reference. if this suitable for this ideas and project and if you can assisting me for this ideas. Hi Mohammad, yes it should be perfect for what you have described. 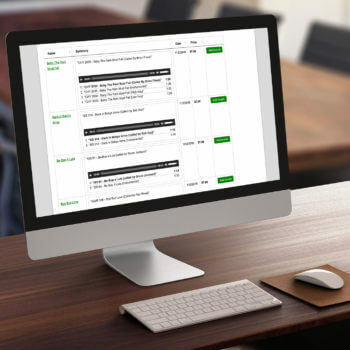 It sounds like you will need our Posts Table Pro plugin. You would create a custom post type called 'Books & Papers' and use it to store your downloadable books/papers, with various extra data to help people find books by topic etc. You would then list them in a table using Posts Table Pro. If your online book is free then you can just add the information about it in the usual way and upload the actual file to the Media Library. You can then link to it by following the instructions in the 'Next, add eBooks to the library' section of the above tutorial. If you have any more specific questions about how it would work for your project, you're welcome to email us at support@barn2.co.uk. Thank you very much Katie and we will contact by email for following this project by helping me. Hi, thanks for sharing this information but does it use PDF format like uploading PDF file for download or just in a text format? Hi Daemon, you can choose what format files to upload including PDF's. In addition, you will also add text to describe the file and make it easy to find and purchase on your website - but the downloadable eBook file that people receive after buying the eBook can be any format including PDF. Both WooCommerce and Easy Digital Downloads have a range of options for how you deliver the ebook to people after purchasing. In either case, you could create a hidden page on your site and publish the book on there. Make sure it is blocked from search engines and not visible to public visitors to your website. When you create the digital product in WooCommerce/EDD, you could enter the URL of this page instead of adding a downloadable file. When someone buys the book, they will receive a link to that page instead of a link to download the ebook. I have a question... Can I set up an ebook store like this but have the authors add their own books to the site.? Like a membership site where authors join and then add their own books (with my approval).